Many people grew up watching Wild Kingdom which the company sponsored for many years. The company is consistently recognized for products that suit middle America and they offer outstanding customer service to agents as well as policyholders. Separately and combined, Mutual of Omaha and its subsidiary companies enjoy excellent ratings from the three largest insurance industry rating services. Mutual of Omaha isn’t just a widely recognized name in Wisconsin Medicare Supplemental Insurance, they also deliver on their promises. They are one of the few Medigap providers in Wisconsin brave enough to publish their customer reviews directly on their website for the public to see—the bad with the good. Out of the 58 Wisconsin customer reviews published at the time of writing this article, 76% give Mutual of Omaha four or five stars, with the vast majority of those being a full 5 out 5 stars. Their average rating from customers comes in at 4.1, with high marks in the categories of both “confidence” and “satisfaction”. Furthermore, 49 of the 58 reviewers said they would recommend the product they chose from Mutual of Omaha to others. But what about those bad reviews? With almost 100 years in the business of providing health insurance, Mutual of Omaha isn’t worried about tarnishing their reputation by publishing their negative reviews as well. While some companies might skew their data, Mutual of Omaha is more concerned with maintaining standards of honesty. Examining the remaining negative reviews more closely shows that they aren’t complaints about the company as much as they are about the plan selected. Five of the six are related to costs or uncovered expenses. All Medigap providers are required to offer the same coverage. Therefore, these customers were probably just matched up with the wrong plan to suit their needs, which is why it’s more important than ever to find a Wisconsin Medicare supplemental insurance agent who can find the right plan for you. Choosing the best Medicare supplemental insurance policy for you requires significant consideration. Getting your Medigap coverage from Mutual of Omaha will make your health care easier and more effective in a variety of ways. No Referrals Necessary. When you enroll in supplemental Medicare, you won’t need to worry about getting a referral from your primary care physician. This means that you can see the specialist that you want without the hassle of extra appointments or communication with your regular doctor. No Networks. Unlike Medicare Advantage Plans, which may require you to choose from health care providers within their network (or face hefty penalties), Mutual of Omaha Medicare Supplemental Insurance for Wisconsin allows you to visit any doctor that accepts Medicare. Out-of-Pocket Expenses are Rare and Low. Although your coverage from Original Medicare (Parts A and B) makes your health care more affordable, being hit with surprise out-of-pocket expenses can be very stressful when you are living on a fixed income. A Medigap plan from Mutual of Omaha can eliminate all or most of your deductibles, copays, and coinsurance. What’s better, you’ll almost never need to write a check for health care expenses. Your provider will bill Medicare directly, the government will pay their share, and Mutual of Omaha will take care of what remains (according to your plan). Travel with Peace of Mind. Your Mutual of Omaha Medicare Supplemental Insurance benefits are valid with any doctor in the United States who accepts Medicare. Visit friends and family throughout the country without worrying about out-of-network expenses or lack of coverage. Furthermore, if you like to travel outside the U.S., you may purchase additional coverage from Mutual of Omaha to extend some of your benefits even to other countries around the world. While Wisconsin Medicare Supplement plans do not use the lettered system you can get a Mutual of Omaha Medicare Supplement Plan G by adding riders to the base plan. 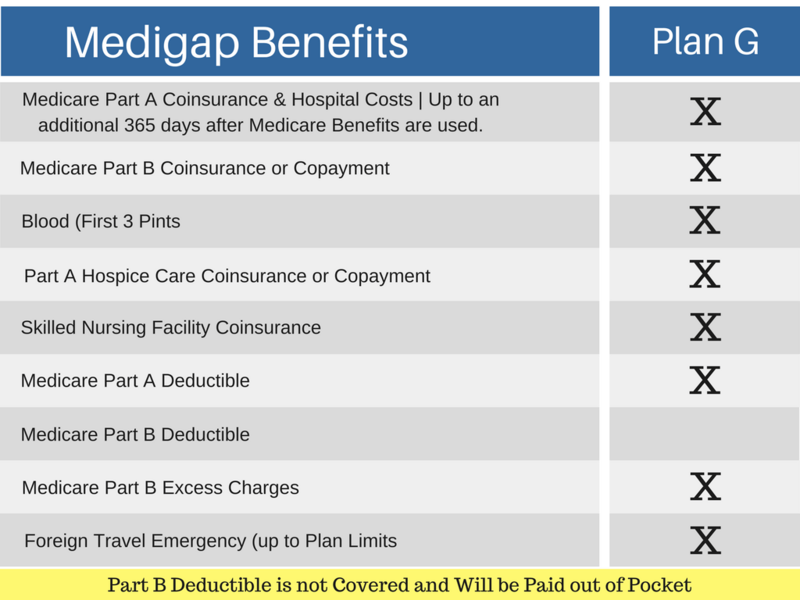 In today's Wisconsin Medicare Market, the Medigap Plan G is the most cost effective plan and with the long history of Mutual of Omaha Medicare you really can't go wrong with a Mutual of Omaha Medicare Supplement. The benefits for a Plan G are below, to see how to make a Wisconsin Medicare Supplement Plan G see our article here. A common misconception among new Medicare enrollees is that that Medicare will cover all of their healthcare expenses. Unfortunately, this isn’t the case, which is why most people elect for additional coverage. If you are trying to decide if purchasing Medicare Supplemental Insurance through Mutual of Omaha is right for you, consider the following out-of-pocket costs that Original Medicare in Wisconsin does NOT cover. Part B: Part B covers most medically necessary doctors' services, preventive care, durable medical equipment, hospital outpatient services, laboratory tests, x-rays, mental health care, and some home health and ambulance services. You pay a monthly premium for this coverage. The monthly premium for most beneficiaries in 2018 will be $134 per month. Your actual premium will be determined by your income. The Part B coinsurance remains at 20% of the Medicare approved amount for services. Let’s put all of that into perspective with a few examples. Imagine you’ve only got Original Medicare and suffer a dangerous fall that requires you to be admitted to the hospital for two days. The Part A deductible is $1,316, which you would have to pay out-of-pocket before Medicare covered anything. What’s worse, your deductible resets after 60 days. So, imagine you need to be readmitted to the hospital four months later for a different reason. That’s another $1,316 you’ll need to cover before your benefits kick in. The costs get even worse if you require long term care. While the first 60 days of skilled nursing facility care are covered, imagine you need to stay for three months for physical rehabilitation. Every day of your third month is going to cost you $329 in coinsurance. That adds up to almost $10,000 in unexpected out-of-pocket health care costs. So you can see why so many people decide to choose Mutual of Omaha for their Medicare Supplemental Insurance. While Medigap might cost them a little bit more in monthly premiums, it is well worth the peace of mind that comes with not having to worry so much about surprise costs that seem almost impossible to pay. While any Medicare Supplemental insurance company in Wisconsin must provide the exact same benefits with the base and riders, Mutual of Omaha stands out with its name recognition and extremely impressive financial strength. For complete information about Medicare Supplement Insurance from Mutual of Omaha, contact the Medicare specialists at Medicare Solutions Team at (920) 545-4884 during normal business hours, or you can contact us here on our website at your convenience.